In a previous post we talked about the basic preparations that any traveler should make before starting the mythical Camino del Inca . So, among many points we talk about choosing the route because, of course, there is not one. In this way, tour operators offer different variants to those who want to launch this adventure but, among the most classic and recognized, there are three routes. Each one of them adapts to the different travelers since they can be done in more or less days, crossing different types of terrains, visiting different sites but, always, arriving at the wonderful Inca citadel: Machu Picchu . This is about a route of approximately 45 kilometers and that tour operators offer to perform in four days and three nights . Ideal for those who have more time and, of course, have the physical and mental resistance to carry out the adventure. This road has its starting point in Piscacucho (km 82), near Ollantaytambo, or in Qoriwayrachina (km 88). There begins the walk that will take travelers to pass by sites such as the ruins of Llactapata that rise to 2,840 meters above sea level. The second day goes up to Warmiwañusca or Warmihuañusca (Paso de la Mujer Muerta) and there an altitude of 4215 meters above sea level is reached. That night they descend 600 meters to the other side of the pass and camp in Pacaymayu. The third day goes up to Runcurakay’s Abra (3,970 meters above sea level) which offers beautiful views. The third day also allows to know the ruins of Runkuracay, those of Sayacmarca, those of Phuyupatamarca and, to culminate the day, those of Intipata (Place of the Sun) and Wiñay Wayna (Always Young). The last day, and after traveling through a forest, travelers climb the 50 steps that will take them to the Inti Punku or Puerta del Sol from where you can see the final destination: Machu Picchu. Called Camino Real de los Incas or Sacred Inca Trail, this takes place in two days and one night . Ideal for those who have little time or for those who do not trust their physical condition too much. This route starts in Chachabamba (km 104) and consists of a four-hour hike to Wiñay Wayna, a site that rises 2,700 meters above sea level. But, to get there, hikers will cross the Urubamba River, visit ruins and enjoy beautiful waterfalls. Later, after another two hours of walking, this time through easier terrain, we get to Aguas Calientes. And the next day, very early in the morning, the hikers undertake the ascent to Machu Picchu, generally with intentions of seeing the sunrise in the Inca citadel. 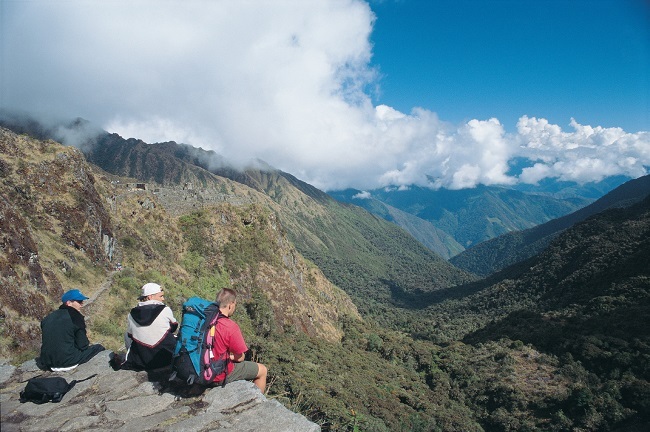 It usually happens that those who wish to make the Inca Trail do not get a quota to do so, that is why tour operators have thought of an alternative for which no permission is required . Although it is not an “official” Way, it is a good option for those who want to give that touch of adventure to the final encounter with Machu Picchu. The Inca Salkantay Trail lasts between five and seven days , it is also a more difficult route than the previous ones since it is a longer option and it takes the travelers to pass through higher ground. The starting point is the town of Mollepata, cross communities such as Cruzpata, Challacancha, and Soraypampa where camping. The second day begins with a three-hour ascent to reach the Apacheta pass (4,590 meters above sea level) and then five hours of descent to reach Rayan-Niyoc or Chaullay where it rests until the next day. During the third day the adventurers leave for Uscamayuc and finish their walk in the town of La Playa. The fourth day will take you to the town of Lucmabamba and the Inca ruins of Llactapata, but the last section will take you to Aguas Calientes, where you will rest and, the next day, go up and discover Machu Picchu.